IE Business School - International MBA | The IE IMBA #1 MBA for Entrepreneurship! The IE IMBA #1 MBA for Entrepreneurship! 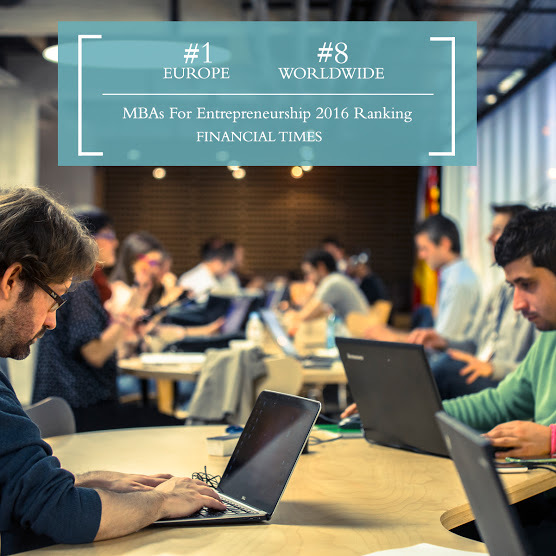 We are very proud to announce that our International MBA has been named #1 in Europe and #8 worldwide in the ‘MBAs for Entrepreneurship’ ranking by Financial Times! This new FT ranking examines the entrepreneurial profile of MBA graduates worldwide and the work carried out by business schools in the area of entrepreneurship. This recognition further consolidates IE’s position among the world’s leading business schools when it comes to shaping entrepreneurs. The ranking is based on data obtained by FT for the paper’s 2016 ranking of MBAs, published in January. It evaluated indicators that include the percentage of MBA graduates who have set up a company, the percentage of women entrepreneurs, the number of entrepreneurs who raised at least a third of their firms’ equity through private investors rather than using their own savings or loans from family and friends, survival rates of firms set up in 2014 or before, the extent to which the skills gained during the MBA helped the project, and support received from their business schools both for setting up the company and for securing funding or key staff. IE Business School’s International MBA has a student body comprised of 90% international students. This year’s intake has students from 65 countries with an average of 5 years’ relevant work experience. The one-year program is available in English and Spanish, and its design permits students to craft a customized program for themselves based on their specific interests and career plans. Students can opt to do the “Creators” track, centered on entrepreneurialism, or the “Transformers track,” if they want to map a career path as directors in the corporate world. Moreover they can choose from among over 150 elective courses to further personalize the learning experience, as well as undertake consulting projects or work on social initiatives in South Africa, Ethiopia, Peru or Brazil. IE Business School International MBA students can participate in the Post-MBA Long Exchange Program, a three-month exchange program which permits them to choose a destination from among 58 partner schools around the world, including Chicago Booth (US), NYU Stern (US), GIBS-Gordon Institute of Business Science (South Africa), London Business School (UK), and Tsinghua (China). They also have the opportunity to further extend their networks at the Global Network Week, travel with the IE’s Venture Lab initiative to examine entrepreneurial ecosystems in other countries, or present their own business projects at Venture Day events held by IE in cities that include Shanghai, Sao Paulo, Mexico D.F., Providence, Berlin, Tokyo and Lisbon. The program offers a total of 66 international destinations to further enrich the MBA experience. IE Business School’s MBA portfolio includes part-time programs like the School’s Global MBA and the IE-SMU MBA, a program run jointly with Singapore Management University and focused on economic and corporate realities in the Asia-Pacific region. IE’s Executive MBA runs for between 10 and 15 months, is available in Spanish and English, and offers both onsite and blended formats. The School’s Global Executive MBA program is aimed at senior managers and combines face-to-face sessions held in Spain, Singapore, Brazil and the US, with online modules. IE also offers the IE/Brown Executive MBA run jointly with Brown University, an Ivy League institution based in Providence, US. The program comprises a blend of online sessions held in Madrid, Providence, and Cape Town (South Africa).